The loose elements resting in the upper bowl area are meant to be rearranged periodically as one is inclined. The various colored segments in the legs are each fabricated by an intensive process of heating, twisting, rolling in powder and fuming with precious metals. Interactive Divinatory Family Portrait, 18” high x 12” x 10"
It’s “interactive” because the linear elements in the top are meant to be rearranged by the owner. “Divinatory,” because it’s part of this series inspired by African divinatory arts. “Family Portrait,” because I was thinking of a workshop I attended once in which different roles and archetypes within family groups were examined through tableaus where participants literally stood in for family members. 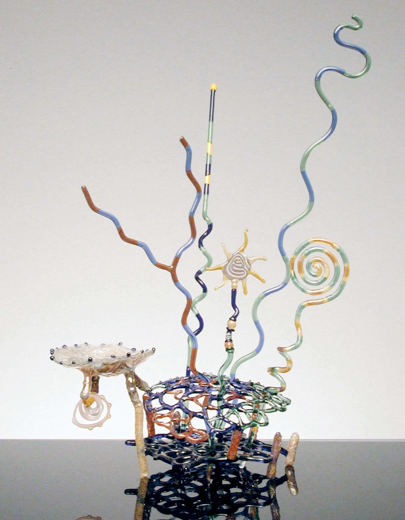 Each of the wavy, curly sticks has a personality that makes the sculpture something like a family unit, which can be arranged in ways that express or examine different relationships. An eclectic mix of colorful elements add to the multidimensional atmosphere of this piece. It seems meant to be used for something, but what? 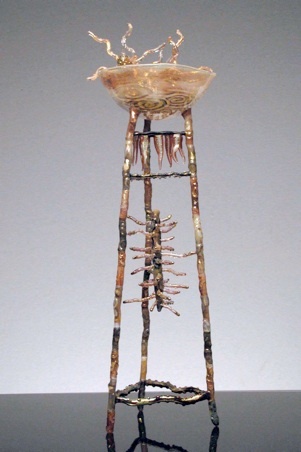 The empty vessel form in the center and the small platform above it invite you to place sacred objects of your own within the sculpture, making you a participant. Or you can leave the spaces empty and allow the invitation stand unanswered. The basic nature of lampwork technique is additive, in that small elements are joined together spontaneously with the torch flame. This method lends itself to fortuitous combinations of forms that reflect the heat of my moment-to-moment creative process. In my own way, I experience a shamanic journey of descent, discovery and healing affirmation in these works, which are strongly influenced by my research into ritual and worship objects used in traditional and tribal societies around the world. My annual pilgrimage to the Gem & Mineral Show in Tucson also rekindles my fascination with tribal sculpture and ornament. Respecting the historical sovereignty of these societies, my intent is not to bluntly co-opt the forms of other cultures for my own purposes. I prefer to experience essential lessons from the varieties of human experience, to resonate with visionary and ecstatic states largely unexplored in our contemporary culture, and to map elements of these journeys through this work. Therefore they reflect my own experience primarily. The intent of these pieces is to spur the viewer in some way on their own journey of discovery, and even of personal ritual. Many of these pieces invite the participation of the owner to rearrange elements, reflecting their own ongoing aesthetic exploration and relationship with the work. The vibrant, complex energy of these pieces is both soothing and dynamic, otherworldly (even multidimensional) yet accessible to daily experience.